[ADVERT]With a vast coastline extending along the western side of the continent, it's only natural that Western Australia has some of the best beaches in the country. Unlike beaches on the east coast, those in Western Australia generally aren't characterised by palm trees, lush tropical vegetation and big resorts. In contrast, the beauty of most Western Australian beaches lies in their remoteness, their relative lack of commercialisation and the striking, vibrant colours of the landscape: the red of the pindan clay, the gold of the sand and the brilliant turquoise of the ocean. The following are a few of my favourites: places which my family and I have discovered during our various camping trips around the state, and have made an impression on us. Due to the size of Western Australia, I'd like to emphasise that this is only a partial list. There are literally thousands of other magical spots scattered along the coastline, waiting for you to discover. With an expanse of sand that appears to stretch on forever, Broome's wide golden Cable Beach would have to be one of the most famous beaches in Australia. It literally took my breath away the first time I saw it. 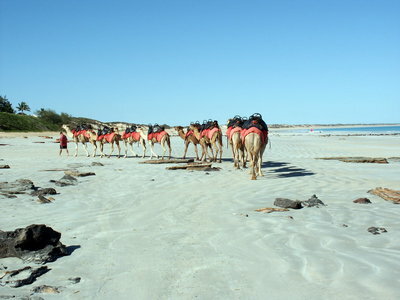 Popular times to visit Cable Beach are at sunrise and sunset, and a 'must-do' experience is to take a camel ride along its golden sands. 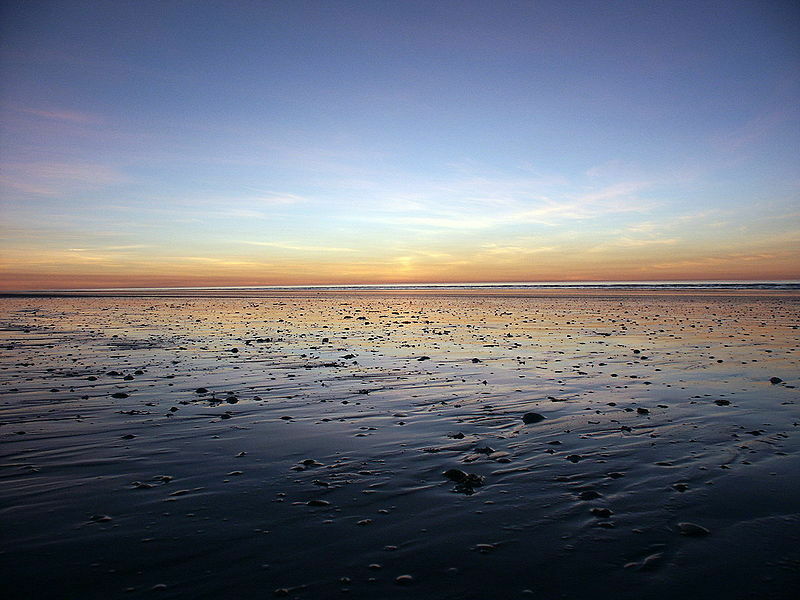 Situated approximately 360 kilometres south of Broome, Eighty Mile Beach is a magical little spot consisting of a just a caravan park and a kiosk. Like many beaches in the Australian tropics, it has a huge tide, and during low tide it's fascinating to explore the many tiny pools where colourful tropical shell-fish can be seen scuttling around. 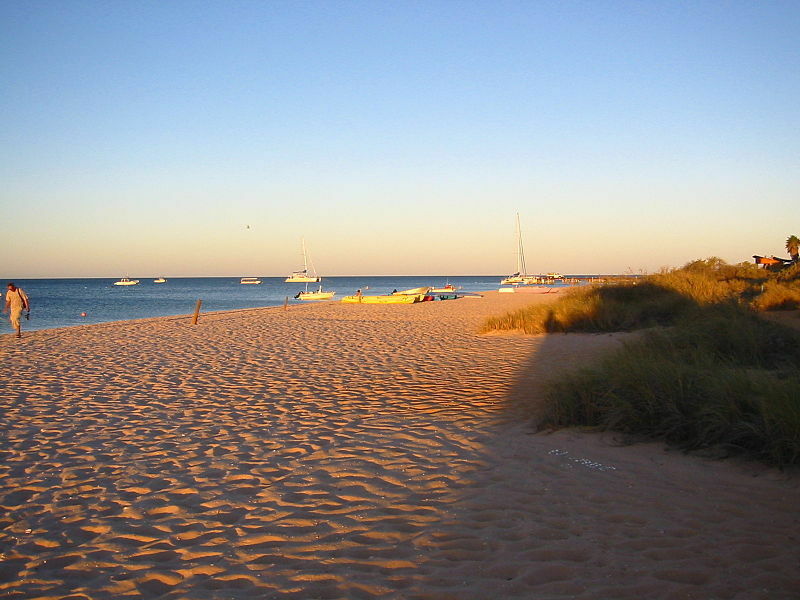 World heritage listed Ningaloo Reef is situated approximately 1200 kilometres north of Perth, and is one of the largest fringing coral reefs in the world. Its remote location has been instrumental in preserving its pristine beauty, and many beautiful beaches line the rugged shore, the most famous of which is Coral Bay. Beachcombers visiting the area are often astounded by the beautiful shells and corals which can be found here. 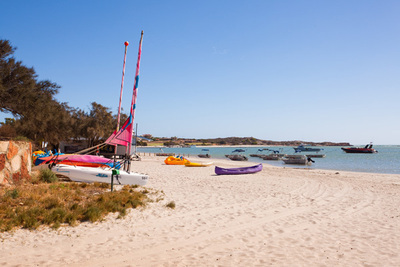 Exmouth, the closest regional centre, also boasts some terrific beaches including Town Beach (the most accessible), Tantabiddi Beach and Turquoise Bay. When my daughter was much younger she had a major crush on dolphins, and therefore for a few years Monkey Mia was our favourite family camping destination. What many visitors to the area don't realise, however, is that Monkey Mia is just one of many beautiful beach-side locations in the Shark Bay area. 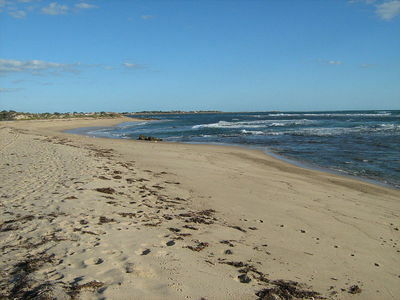 Typical of many beaches in the far north of the state, those in this region are characterised by the brilliant colours of the surrounding landscape. Shallow and sheltered Little Lagoon, situated just 5 kilometres from Denham, is perfect for young children, while Shell Beach, which is 45 kilometres from town, stretches over 100 kilometres and is one of just a few places on earth where tiny shells replace beach sand. Kalbarri has been one of Western Australia's favourite holiday destinations for years, offering a combination of exquisite beaches on the coast and dramatic gorges inland, along the Murchison River. 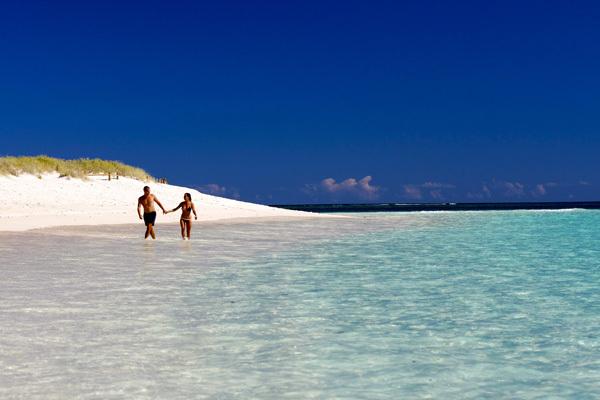 Some of the most popular beaches here are Blue Holes and Chinaman's Beach. Dongara is another perennial family favourite, and its popular beaches include Seaspray Beach, Surf Beach and South Beach. Guilderton is situated at the mouth of the Moore River, and despite being only an hour from Perth, it has a delightful otherworldly vibe. With plenty of sandy beaches, it's perfect for families and the sheltered waters of the river-mouth are great for young children to splash around in. During the warmer months it's possible to hire a canoe and explore further upstream. From the far northern suburbs of Perth down to Mandurah in the south, there are many terrific beaches in the Perth region. Some of the most popular include Scarborough, Swanbourne and Cottesloe Beaches, as well as the numerous magical bays of Rottnest Island. 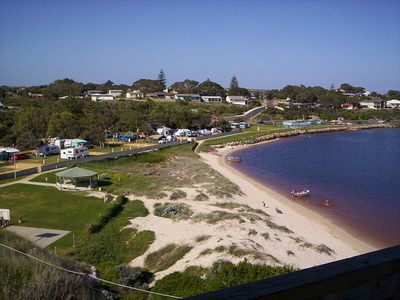 Situated on beautiful Geographe Bay, Dunsborough is a popular beach-side destination for visitors of all ages. However, it's especially popular with young families as the waters are very calm and protected. Some of Australia's most popular surf beaches are located in the far south-west, including the iconic Yallingup and Prevelly Beaches. The region is one of the state's greatest tourist draw-cards, and there is much to see and do here, both on the beach and on dry land. Situated on the rugged south coast, Albany boasts some of Western Australia's most beautiful beaches, including popular and family-friendly Middleton Beach and Emu Point. Nearby Denmark is also a favourite with veteran beach lovers, and offers plenty of choices. We discovered Hopetoun by accident a few years ago while we were travelling along the south coast, and were completely charmed. A small isolated town, situated between Albany and Esperance, and surrounded by national parks, it boasts a lovely beach, a handful of shops and several accommodation options. 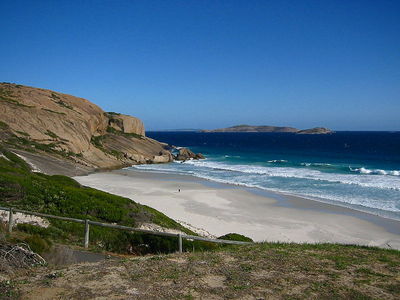 Some of Western Australia's most beautiful and pristine beaches can be found in and around Esperance, in the far south. Lucky Bay and Esperance Bay are two of the best known. Why? Western Australia gets very hot in summer so it's useful to know the best spots to cool down at.